Beware of the troll that lives under George Washington Memorial Bridge! 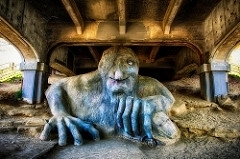 The Fremont Troll is a huge mixed media sculpture that was created by four local artists. It was commissioned as part of a rehabilitation project for the area under the bridge. You can now drive up the hill and right up to the troll to take a picture, or park your car and stroll through the rest of Fremont. If you are feeling hungry, make sure to stop at Cafe Turko at the bottom of the hill for delicious treats and Turkish coffee. Yes, you read that correctly - a statue of Lenin does exist in the self-proclaimed “Artists Republic of Fremont”! A former Washingtonian found the 16 foot tall bronze statue in Czechoslovakia, and purchased it to preserve the artistry of the sculptor. The buyer died soon after it was shipped to Washington, and the family is still looking for a buyer to purchase the statue. Until a buyer is found, it will remain at the intersection of Fremont Place North, North 36th Street, and Evanston Avenue North. Fremont’s unofficial tagline “The Center of the Universe,” has inspired space-themed public art around the neighborhood. The Fremont Rocket was constructed out of military surplus, and has a 1930’s sci-fi vibe. Across the street from the rocket is a giant fiberglass Saturn, complete with solar panel rings. A few blocks north of the Saturn is another planet-themed art installation, with three planets suspended on poles. If you are ever lost in the Center of the Universe, just find the guidepost at the intersection of Fremont Place North and North 35th Street. These are just a few of the quirky things about the neighborhood of Fremont. If you had your fill of public art and good food, make sure to check out Gas Works Park. This park is not technically in Fremont, but just east of the neighborhood. Enjoy the best view of downtown Seattle and South Lake Union from the grassy knoll, or explore the remnants of the sole remaining coal gasification plant in the United States. We hope you have a good time in Fremont. If you take the Fremont Bridge back to the conference center, make sure to wave to Rapunzel on your way out!